After a hectic week in London we finally departed St Kat's on Sunday to large crowds of family and friends which was surprisingly emotional. 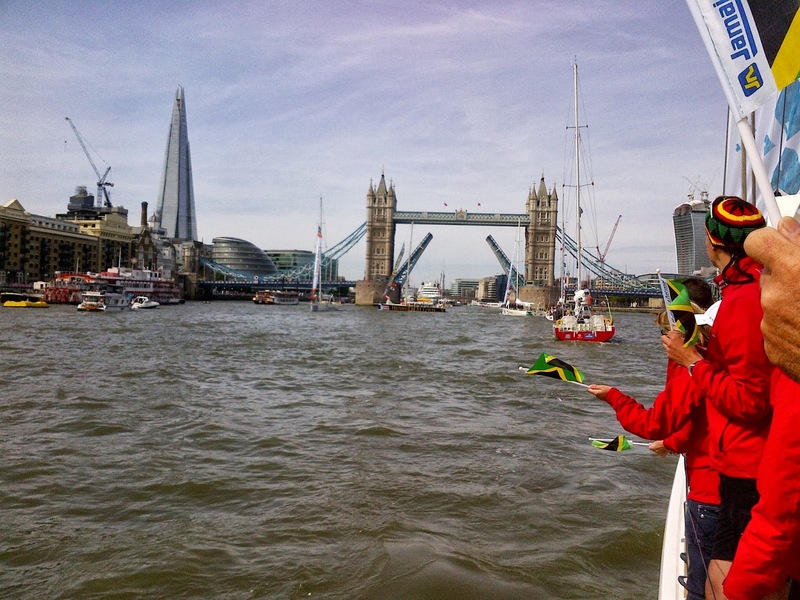 A few laps up and down the Thames and we headed downstream accompanied by lots of spectator boats coming in close for finally shouted goodbyes. After we left them behind a quiet reflective mood descended on the crew, especially the round the worlders who would not be returning for over 10 months. We moored up on Sunday night off Southend and then prepared for the race start on Monday at 9.30 am. While the norm is 2 watches, or shifts, we were all on deck for the downwind start and it was a little chaotic, not helped by a tangle on the mainsail halyard 10 minutes before the start. Anyway all was sorted and we crossed the line in a good position and all was going well in a strengthening breeze until we noticed the mast moving alarmingly in a way it wasn't meant to! Sails were dropped and we spent about 2 hours putting a makeshift solution in place by which time we were at the back of the fleet. All very frustrating but as Skipper Pete pointed out this is a marathon not a sprint and there was plenty time to catch up which is exactly what we did until a wineglass ( that's a horrible twist in the middle) in the spinnaker slowed us down again. We decided the tactic to get to Brest was to stay to the north and pick up favourable tides carrying us west until diving south to Brest, which would have been fine had the course not been shortened at 3 hours notice. No time to do anything about it and so a very disappointing and frustrating finish to our first race. We then motored towards Brest through some thick night time fog which was completely surreal, keeping a close eye on the AIS system as well as radar and two watch keepers on the foredeck, our entire world limited to the boat as beyond there just seemed to be nothing. With sunrise the next morning, the mist cleared and our spirits rose as frustration gave way to a determination to make amends on Race 2 to Rio, departing from Brest on Monday 9th September.